Quarried from the nethermost depths of the earth, marble is formed through the metamorphosis of limestone. No two types are exactly alike; these natural stones vary in intricacy, vein patterns and even colour. From Calacatta and Carrara to Volakas and Thassos, the range is many – some more sought after than the other for its rarity. Aesthetics aside, this rock is also intimately intertwined in history bringing to mind significant works of art such as the majestic Taj Mahal and Michelangelo’s David. Long gone are the days where this highly-coveted stone was only used by sculptors and artisans. Today it is used with flourish within interiors, giving owners the opportunity to carve their very own high-end home. Acquiring marble is an investment, so your decision shouldn’t be made on a whim. Understanding how the stone is graded will ease your path to picking the right slab. Unlike the education system where a higher rating denotes a better score, marble is graded differently. Its grading system isn’t an indication of quality, merely the stone’s aesthetic appearance. Rocks classified under Grade A are generally subtly veined as they display few geological flaws. Lesser fissures mean they’re easier to work with, but this also makes them less visually arresting. Those parked under Grade D exhibit the most natural faults and thus, require more repairs than the other groups. But on a brighter note, these imperfections result in the most dramatic and decorative patterns. As a calcium-rich stone, marble tends to continually change over time and especially with regular use. These blemishes show up more palpably in white marble. This is why meticulous and consistent care is necessary to ensure your rock remains in tiptop condition. Anything acidic will etch your precious finish and then leave a dull mark. Take particular care with food items such as lemon juice and vinegar – especially if you cook often. If spills happen, wipe immediately. To clean, simply use a soft towel lightly soaked with a gentle detergent that’s been diluted with water. Avoid anything overly harsh or abrasive; these will cut into marble’s soft surface. 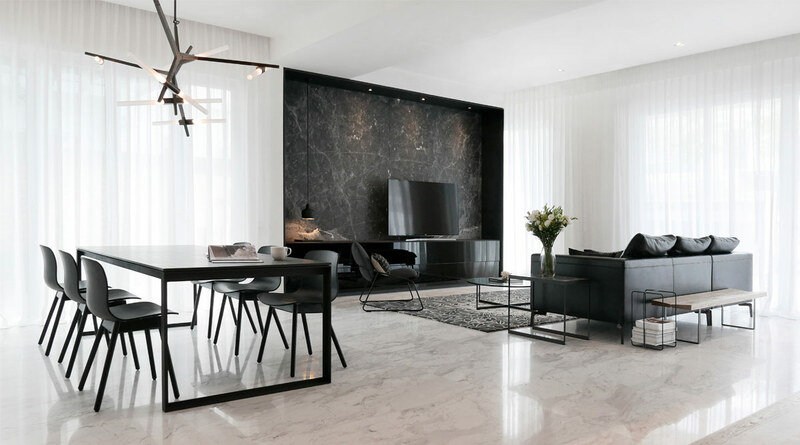 This interior is a study in posh minimalism, proving that luxurious doesn’t need to be ostentatious. 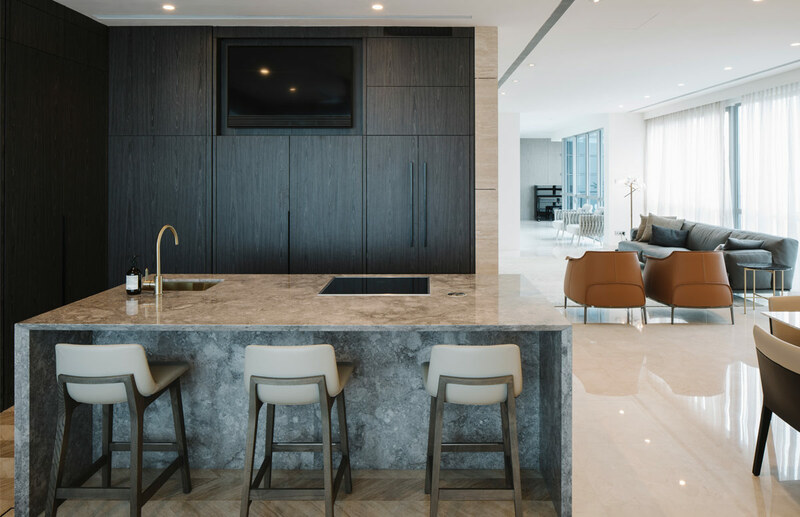 A restrained approach in design sees the deliberate use of natural stone take stage in the living area. 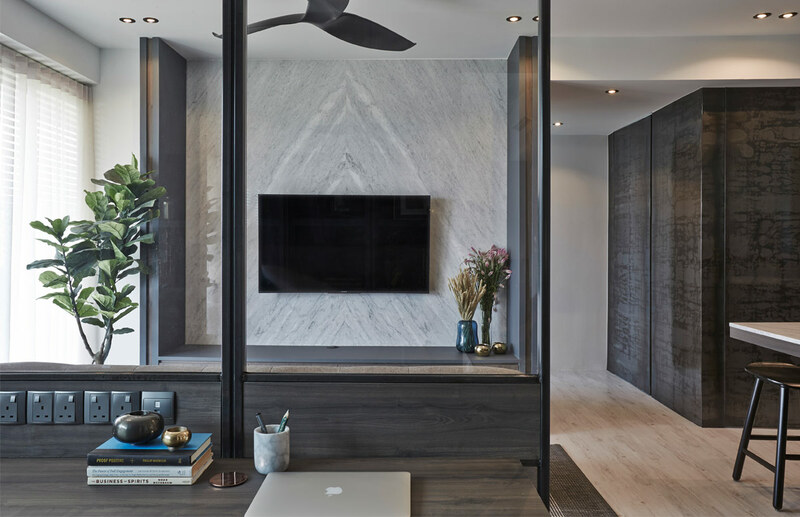 In a daring shade of noir, the feature wall blends seamlessly with the television and console yet it helps break the monotony of its monochromatic setting. Dramatic streaks across the stone’s shadowy base bring an atmospheric vibe into the space. Hailing all the way from Greece, Volakas marble features flowing ribbons of silver and pewter in a canvas of alabaster white. 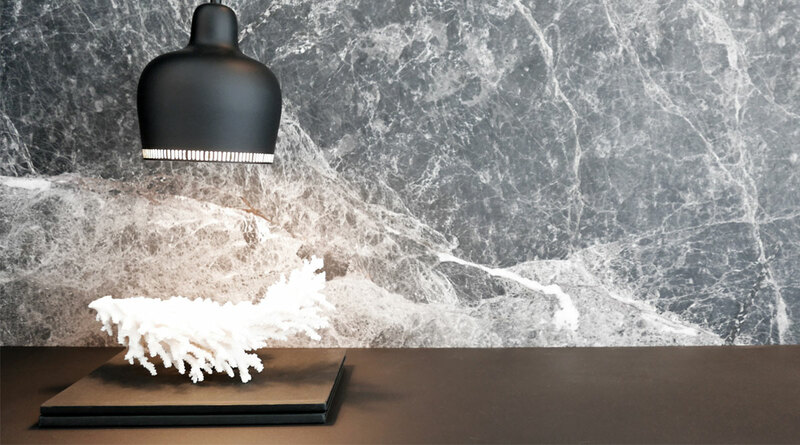 This stunning stone is used to construct a powder room, enclosing its minimalist space with a dash of drama and glamour. 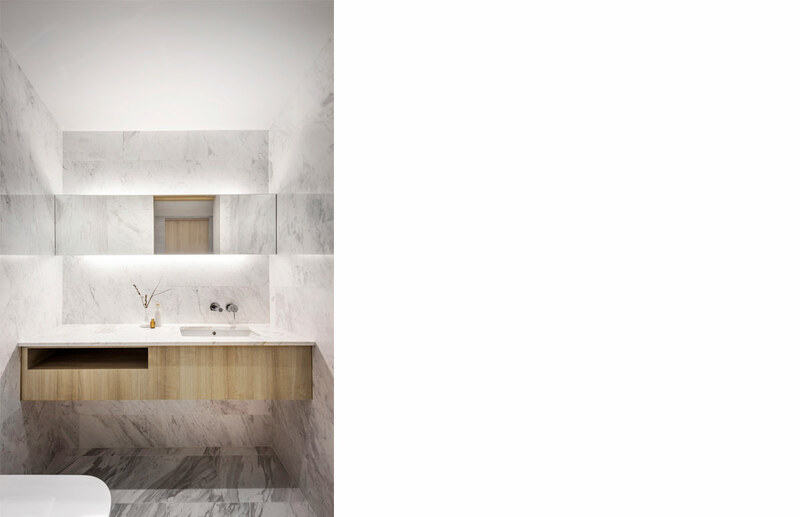 The blonde wood veneer that clads the vanity cabinet creates subtle contrast and makes the perfect accompaniment to marble’s coolness. Taking pride of place in this dry kitchen is a bespoke waterfall island counter sculpted from marble. In a cloudy-textured smoke grey, it adds to the tactile quality of the area and provides contrast against the handsome dark wood panelling of the pantry cabinet that surrounds it. Good looks aside, this pretty centrepiece is also practical, providing ample counter space for prepping as well as playing a role as a secondary zone for mealtimes. Large marble tiles dress this monochromatic kitchen in the form of a backsplash, bringing depth and character into the worktop’s pristine landscape. Anything too bold might appear out of place. 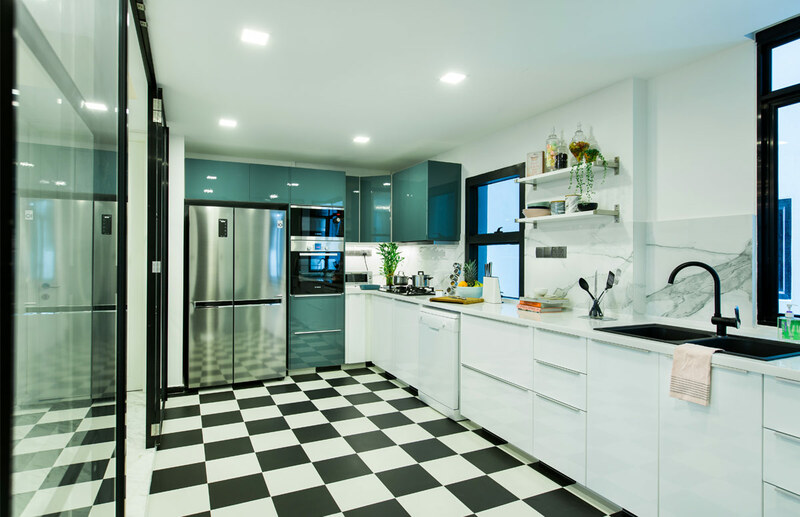 Thus, the particular pattern that was picked – a smattering of subtle striates on a predominantly white base – serves to infuse a sense of lightness that complements this cooking space. If acquiring multiple slabs of marble prove to be too much for your pocket, introduce a hint of luxury through furniture pieces. 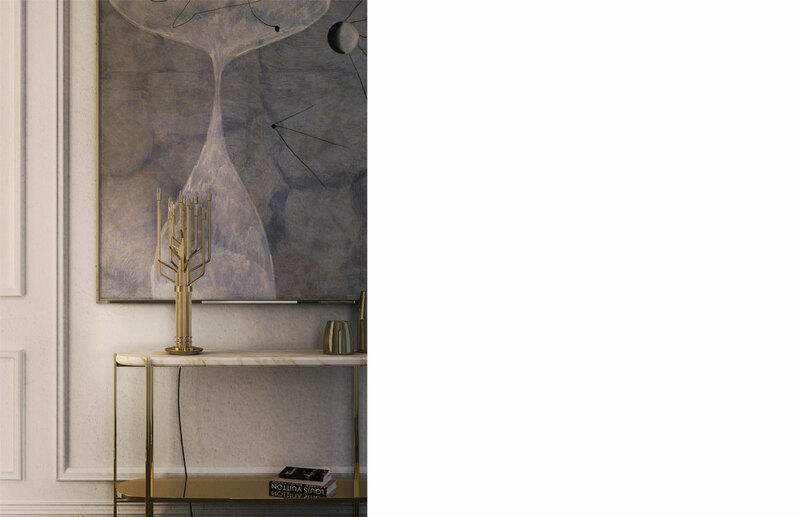 This console table that’s topped with Carrara Marble not only adds dimension to an entryway or a corner in a communal area, it also offers useable counter space to place light fixtures, decor items or a collection of personal trinkets. White marble is unquestionably a classic, but this opulent stone does come in other colourways like green, pink, black and even gold. 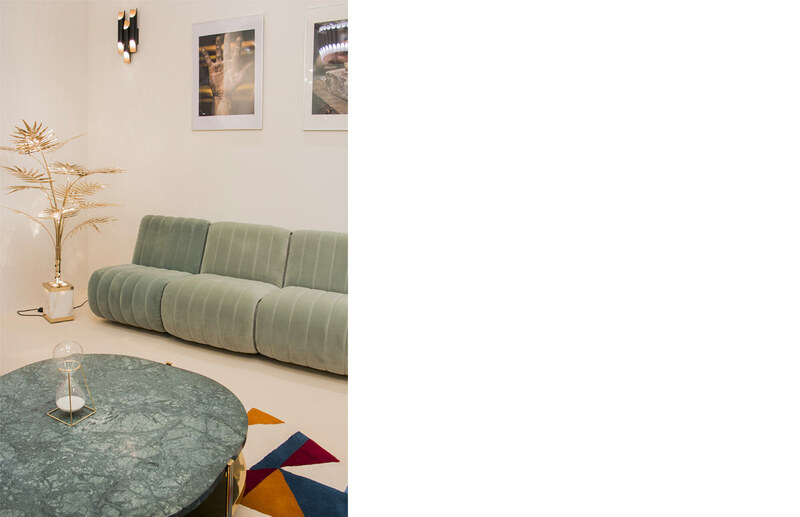 Case in point, this coffee table with its Verde Guatemala marble top carries a strong presence in a living space. Its gold accenting elevates its polished appearance. As this elegant emerald stunner is placed in a largely neutral setting, it is able to command attention without appearing overwhelming even in a tiny home. If your decision to purchase marble is set in stone, consider honed or matte finishes instead. They camouflage little flaws more effectively than a polished surface, so you won’t fret too much over what you can’t really see.